Unilever and Mars were among the first household names in the food and drink industry to announce plans for a 100% shift to renewable energy. But few of them have a specific deadline, while some still heavily rely on biomass, which is controversial, because of potential competition with food crops. A move to cleaner fuels and measures to cut energy consumption have already enabled food and drink manufacturers to reduce carbon emissions by 22% between 1990 and 2012, according to the European Environment Agency. In total, fuel consumption across the food and drink industry was slashed by 65% between 1990 and 2012, according to EEA figures. Most of these reductions came from energy efficiency improvements, and a move towards cleaner fuels — replacing, for instance, coal and heavy fuels with gas, according to FoodDrinkEurope, an industry trade group. In July this year, FoodDrinkEurope published an industry-wide survey. It found most European food manufacturers had started shifting to renewable energies, with 90% of respondents saying they were already using them. "There is a general and accelerating move towards renewable and clean energy in agriculture and the related food industry in Europe," says Lars Hoelgaard, a former deputy director at the European Commission's Directorate-General for Agriculture, who is now a senior fellow at Farm Europe, a think tank. The former EU official points out that these changes were partly driven by policy. "Some major food companies which are energy intensive like big slaughterhouses and dairies are subject to the European Emission Trading Scheme," which puts a cap on greenhouse gas emissions at factory level, Hoelgaard told EurActiv. So one way of staying within the limit was to increase use of manure and silage as biomass for the production of electricity on the farm, Hoelgaard says. 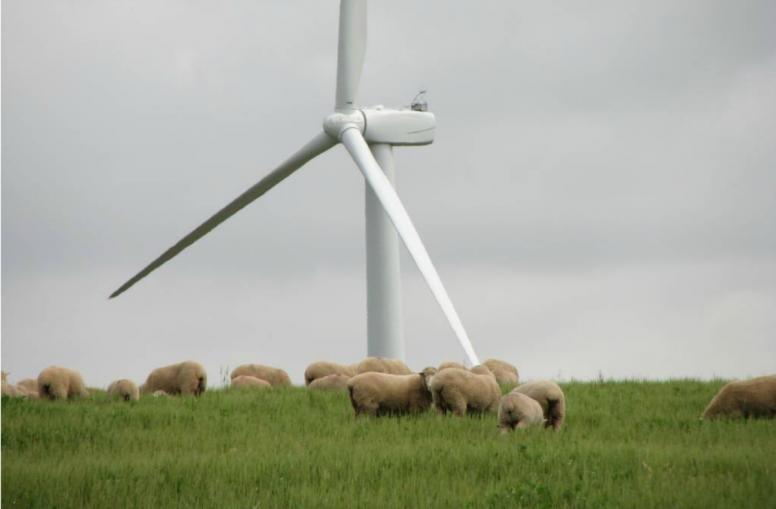 Switching to renewables probably comes more easily for the food sector than elsewhere. After all, the biological origin of by-products and waste coming from food and drink processing makes the switch more natural. According to the European Commission, every tonne of bio-waste sent for biological treatment can deliver between 100-200 cubic meters of biogas, thereby reducing dependency on fossil fuels and cutting greenhouse gas emissions. Lured by the potential, some companies have embarked on ambitious plans to go 100% renewable. At Mars Inc., a number of European factories are already producing biogas from waste water, helping to reduce emissions and energy consumption. “We have an ambitious goal ― reduce our dependence on fossil fuels and eliminate 100% of GHG emissions from our operations by 2040,” said Juan Manuel Banez Romero, European Government Relations Manager at Mars. “To do so, at our European sites, we use biogas to heat water and fuel boilers,” Romero explained, saying this prevents methane from being released into the atmosphere and reduces natural gas consumption on those sites by “approximately 3% annually”. More generally, the industry is growing increasingly aware of the need to cut its energy consumption, whether directly or indirectly by cutting waste. “The issue is not only about treating waste but also saving energy, water, greenhouse gas emissions which were generated to produce this waste” in the first place, remarked Pascal Gréverath, a Nestlé executive who chairs the sustainability committee at FoodDrinkEurope. The first priority for food companies is to prevent waste from happening at all. But where waste is generated, it can be reprocessed as an intermediary product instead of being landfilled or burned for energy recovery. “Otherwise, it can be re-used for pig farming as animal feed or ultimately for land spreading,” Gréverath said, provided some quality criteria are met. In the end, he says, this is “a win-win solution". Environmental activists are more sceptical however. They warn that bio-waste cannot be a long-term renewable energy solution. “There is no magic bullet,” said Ever Mitchell, from Food and Water Europe, a green campaign group. And although these initiatives might sound good, she says the devil often lies in the detail. “For instance, I see mention of biofuels, which for us is unacceptable. Using food for energy is really questionable when people are hungry,” Mitchell said. The risk of misusing bioenergy is actually recognised by the industry itself. British-Dutch food giant Unilever for instance has been pushing for governments worldwide to carry out in-depth impact assessments of their bio-energy policies in order to avoid negative side-effects on the environment. “One such risk is the potential impact of biomass energy programmes and biofuel targets, in particular on food security and sustainable agriculture,” said Unilever, advising against first-generation biofuels based on vegetable oils, starch ethanol or sugar ethanol. “The use of valuable food crops for energy purposes will increase pressure on eco-systems and biodiversity. Deforestation, particularly in the case of palm oil and soybeans, could lead to the devastation of the last remaining rainforests in Borneo and the Amazon region,” Unilever said in a statement. The warning also applies when using bio-waste for burning, which the Commission says is currently “very common” in the European Union. And while the incineration of bio-waste can be carried out using the efficient cogeneration of heat and electricity, burning also generates greenhouse gases and other pollutants such as dioxins, the Commission warns. “So, yes, it’s better than putting that waste into landfill but it can’t be claimed to be a solution really,” Mitchell said. Over time, bio-waste may become less of an issue however, as food companies gradually switch to renewable electricity. In the US, Mars launched a gigantic wind farm project to supply its 70 production sites there with renewable energy. Called Mesquite Creek, the farm project spans 25,000 acres, or around the size of Paris. “This makes Mars the first major food business to source all of its electricity for its US operations from renewable sources,” boasts Romero, the European Government Relations Manager at Mars. Other large food companies have similar goals. For instance, all of Unilever’s manufacturing sites in Europe now purchase electricity from renewable sources, aside from those that source electricity from energy-efficient combined heat and power (CHP) plants. In the long run, the company’s goal is to rely 100% on renewable energy although it doesn’t have a set date for achieving that. Looking forward, the carbon constraint placed on the food industry is only likely to encourage renewables, says Hoelgaard, the former Commission official. "By 2030 the reduction has to be at least 40% for the companies subject to ETS. Food companies will have to continue their good progress. It is should be doable but requires an extra effort," Hoelgaard said. According to the European Commission, the food and drink sector contributes to some 23% of global resource use, 18% of greenhouse gas emissions, and 31% of acidifying emissions. An EU sustainable food chain roundtable was launched in May 2009, bringing together policymakers, farmers, food and drink producers, packaging firms and consumer organisations to develop methodologies to measure the environmental impact of the food and drinks industry. The round table’s main achievement was the publication of a global methodology for calculating the environmental footprint of food and drink products, which was formally agreed in January 2014. On the regulatory side, the executive followed up in 2013 by issuing a non-binding recommendation on how to measure and communicate the environmental performance of products. A series of pilot projects were subsequently launched by the European Commission in June 2014 to assess the environmental footprint of specific products like beer, coffee, meat, pasta or packed water. Those are expected to conclude in 2017 with a harmonised methodology for each product category. The Commission will then review the pilots and decide what policy conclusions can be drawn. The European Biogas Association (EBA) said it firmly opposes the incineration of organic waste coming from the food industry and households. "We strongly support minimising waste production as much as possible, in particular of edible food. The waste from food and beverage production and residues from agriculture that cannot be avoided should be recycled in biogas plants bringing two valuable products: renewable gas for electricity, heating and transport, and organic fertilisers (similar to compost), which take valuable nutrients back to the soil. In addition, this process also avoids GHG emissions from reaching the atmosphere what is normally the case for untreated organic waste. Feedstock for anaerobic digestion plants is sourced locally, usually a few kilometres away from the plant, meaning that biogas is a truly decentralised energy production and a recycling method, having nothing to do with rainforests. We welcome the initiatives of the food and drink sector to develop sustainable and efficient systems to recycle their waste."